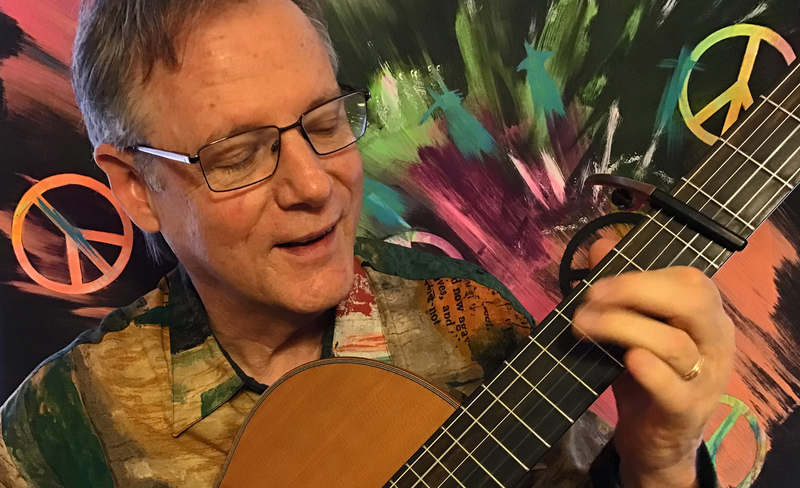 Fingerstyle guitar master, Rick Cyge shares favorite music from the Woodstock Generation at Mary D. Fisher Theatre on Saturday, April 6, 2019. Recently voted “Sedona’s Best Musician” in KUDOS Reader’s Choice Awards, he will perform exciting fingerstyle guitar arrangements of music from the iconic era of the ’60s and ’70s. The evening promises an uplifting and nostalgic journey into shared musical memories of the past! The concert begins at 7:00 p.m. and tickets are on sale now. With his vast repertoire of songs from the iconic Woodstock era, Cyge comments, “The hardest part of putting this concert set together is deciding which gems to include! Re-experience this much-revered music. Although his focus over the past twenty-five years has been instrumental music, both as a soloist and in his guitar/flute duo with his wife, Lynn Trombetta as Meadowlark, his roots run deep in folk and acoustic music from his days in the vibrant Boston music scene of the 1980s. In Sedona, Cyge has established himself as a popular and respected instrumental fingerstyle guitarist with a large variety of Baby Boomer classic songs uniquely arranged for solo guitar. Cyge has twelve CDs to his credit, most with Meadowlark, in addition to numerous projects as a sideman in the studio for various artists. In the last few years, Cyge has recorded and released two self-produced solo fingerstyle guitar CDs, “GUITARtistry” and “GUITARtistry 2” featuring his guitar artistry through his arrangements of what he refers to as “Baby Boomer Classics” with a few original compositions included. This concert will be a glimpse into Cyge’s passion for the music of the Woodstock era! His CDs will be available at the event. Visit www.rickcyge.com for additional information.